Welcome to the online home for BSA Troop 107. This website will serve as a basis to promote our troop and share information. The site is designed in accordance with the Unit Website Guidelines of the Boy Scouts of America. Some pages require a password. Let us know if you need your login information. Let us know if you need your login information. Its 2019! 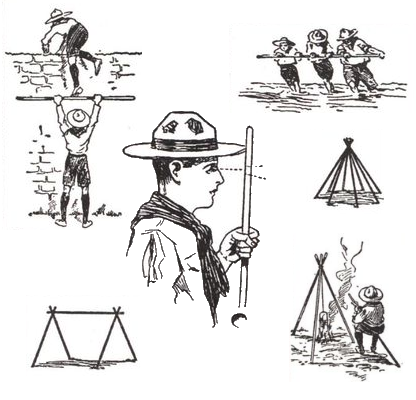 Scouting has gotten a year older. As scouts, we strive to be Eagles. Make 2019 the year to change your bad habits, the year to learn a new skill, make 2019 the year you get closer to Eagle. Whether it’s swimming or knots there’s always something holding you back. If you can knot tie all the knots, work on a knot a week. Just like God isn’t only in church, Marriage isn’t only at the altar, knots aren’t just at the scout hall. Take 15 minutes a day and study a knot. After you get that knot down, do two next week. Read your scouting book, read your bible, iron your uniform before meetings, tuck your shirt in. You represent Boy Scouting. Make every day in 2019 representative of God, you and Boy Scouting. Hope everyone’s 2019 goes well and is prosperous. Hey! This week we started the meeting as per usual. The scouts then went out and played the same teamwork activity that we did last week with the staves. We got to hear one of our leaders talk about his experience of moving from Canada to America. Getting his point of view on the hardships he had to face becoming a U.S. citizen. He said that he enjoys the US, starting out as a place for work then deciding to move here. I asked him about how he feels about the safety if America and that he isn’t personally scared of anything happening to him here. He brought up about the local culture and how much he loves this area. Overall eye opening to how amazing the Holston Valley and surrounding areas are and to the fact that the Government are handling the immigration situation so well. Happy Halloween! We opened the meeting today as usual; a good bunch of kids. We reviewed the bowline this week with good success! This weeks activity was a teamwork exercise! We all grabbed a scout stave and got in a circle. Jay would say left or right and we had to follow. Even with the occasional stick to the head it was a fun night. We listened to Clayton, our Senior Patrol Leader, talk about the history and the hardships of Bristol. He showed us pictures of the dam, the sign, and the train station. To finish the night, we reviewed some basic scout knowledge in a game of Scout Jeopardy. The Apache patrol against the Sycamore Patrol in a neck to neck race A fun and eventful night with lots of events planned for the rest of the year! 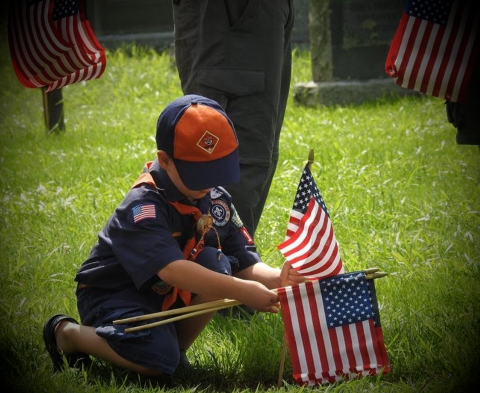 Scouts were honored to participate in flag decoration at Cold Spring Cemetery on Memorial Day. You’ll find soldiers here from the Revolution through Vietnam and most every conflict in between. 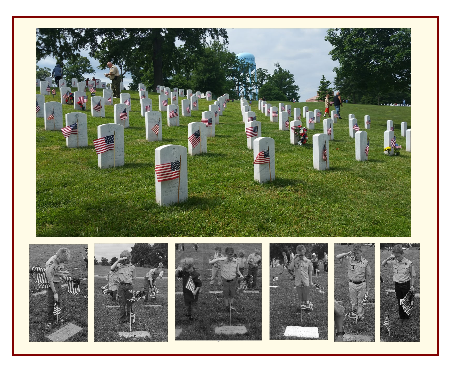 We honor and remember those that have fallen. As part of the service, there were reenactors from the Revolutionary War and Civil War. The troop assisted our Cub Scout Pack in gathering 621 pounds of plastic bags as part of a recycling program that turns waste into environmentally responsible outdoor products. 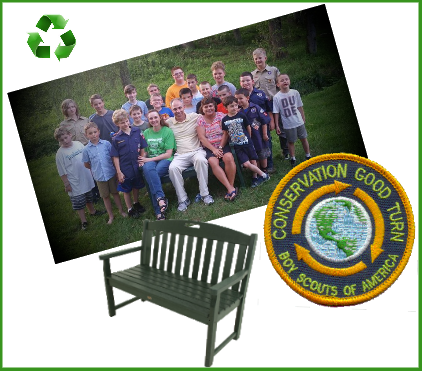 We received a bench (made from recycled plastic) that will be used at the Cold Spring Activity Center so that it can be enjoyed by the community. The bench was unveiled at a recent meeting and displayed to church members who participated in bringing in recyclable materials. Thanks to all who participated. This project has inspired other area groups to do the same. Scouts earned a Conservation Award for this effort. After a night of camping, our troop hosted a booth at the 2017 Scout Expo at the Appalachian Fair Grounds in Gray, TN. Our booth showcased both practical and fun uses of a scout staves.